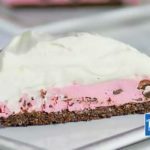 A delicious homemade Low-Carb Raspberry and Chocolate Cream Pie. Sugar-Free with a tasty cookie base. This is an My Keto Kitchen Original Recipe developed and made easy to cook at home by all. Preheat fan forced oven to 160C/320F. In a bowl mix together the almond meal, truvia, cocoa powder and butter. Press the mixture into the base of a 9.5in pie plate and bake for 18 minutes until firm around the edges and slightly puffed in the centre. Dissolve the jello in the boiling water and allow to cool slightly. Add the softened cream cheese, truvia, vanilla extract and heavy cream to the bowl of your stand mixer and whip on medium speed until fully combined. Turn the stand mixer onto low speed and slowly pour the jello mixture into the cream cheese mixture. Return the speed to medium and whip until fully combined. 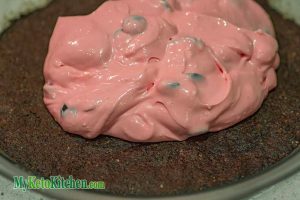 Remove the bowl from the stand mixer and fold the sugar free chocolate chips through the jello and cream cheese mixture. Pour the mixture on top of the cooled chocolate crust and spread evenly. Set in the fridge for 30 minutes. After setting, top the pie with freshly whipped heavy cream. Cut into 12 pieces and serve.